This week, The Gap changed their Logo…..
And since its quiet revealing, it has endured every “un” imaginable… uncreative, uninspired, uninteresting. You’d believe that the GAP has given up, banished from the world of fashion and marketing. I picture 15 GAPs seated in a room, sporting their best suits and stiff with the reality that vacant malls don’t attract business. The GAP needs to be online and in a big way. Logos are a critical piece of brand recognition, but I don’t think this Corporate Picasso heralds the GAP down into oblivion. It is the execution; bad publicity, boring fashion and most prevalently, existing in shopping malls … that are all far more likely to be their undoing than a bad font and some pixels. Beverage maker Pepsi re-brands their same sugar water product every 10 years or so; it makes sense, after all, they are on a never ending quest for the Next Generation of soda drinkers. 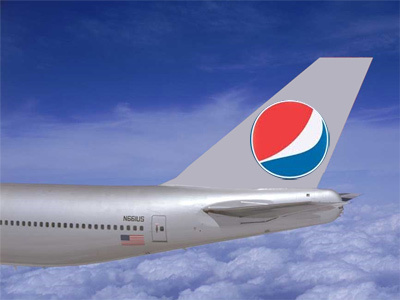 And the Next Generation of Pepsi drinkers have a disdain for capitalization, a preference for ultra-thin rounded sans-serif and decals for airplanes. AOL rebranded, too, choosing the same bold, sans-serif font, but this time actually capitalizing and punctuating their name, presumably to symbolizing “AOL” as a sentence or exclamation like “Thanks.” or “Please.” with a side order of web-speak a’la “LOL”, “ROFL”, or the more gregarious “ROFLMAO”. “Aol.” looks like something I should try to pronounce, but I can’t seem to get it out without phonetically uttering “Ahole”. 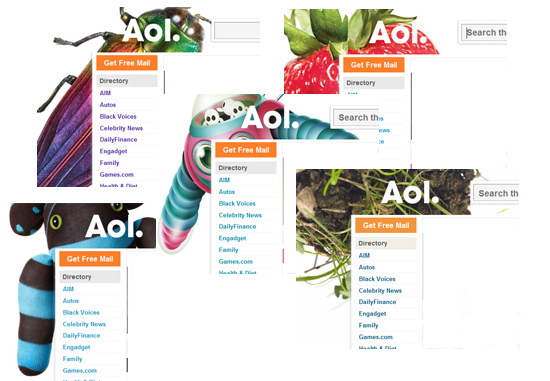 The new “AOL.” name is attached the backgrounds of pretty much anything, so “Aol.”, I assume, is anything I want it to mean. It’s interesting and kind of cute, but I think consumers still don’t buy that “Aol.” is the best source for anything except dialup Internet and piles of free CDs. Seattle’s Best! Bright red, curved edges, a badge with an aura of establishment, esteem and importance. But the new logo looks like something Haliburton would print on the side of the chemical trucks used to drill gas and contaminate local water supplies. BP went from a shield surrounding their “BP” to the Helios, a logo worthy of a huge global energy company. Looks very plant-like. And it’s green. Lower-case abbreviation again, cleverly hiding “Petroleum” (Having “Petrol” in your name is sort of like being named “I hate the environment”). As far as logos go, I like it. It’s far less industrial-looking than Seattle’s Best. 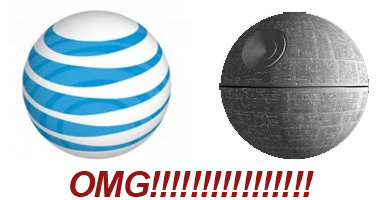 Maybe they should swap corporate artwork? Maybe… just maybe with all of the bad press BP has had this year a little logo swapping could convince us the Gulf Oil Spill was a really, really bad Coffee accident? This juice is now squeezed fresh from Orange 2.0! What exactly is this globe thing supposed to be, anyway? The true magic of Google’s logo is that the actual name itself is almost irrelevant; it’s the colors used to represent it. The colors are bright and colorful, like a playground, toy box, or kid’s cereal. These colors follow through pretty consistently in almost every Google product. Logos are important for branding. Simplicity is key to a good logo; some get it right and never really need to change. McDonald’s Arches, Target’s Target, Toyota’s Elipses – all symbols to instantly jog our minds from age 2 to age 102 with personal experiences and perceptions of that company and its products/services, both positive or negative. GAP is doing the right thing. 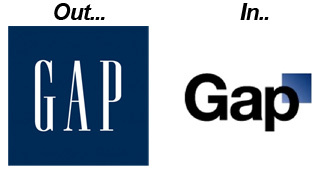 GAP’s decision to change their logo isn’t ill-founded. But they may have been well to consider evolving their logo more gradually; fashion changes every year, and if soda can do it all the time, I’m pretty certain a clothing store could, too. It’s clearly an effort to attract and focus more on the Web demographics, and with the growing trend of Web shopping vs. mall shopping it’s smart for them to make the effort. But I still don’t buy from The GAP. Know any more trendy re-brands? …or have any thoughts on the GAP logo? Please share below!